It goes without saying that Pontiac produced some awesome vehicles in its 80-plus years of existence. Cars such as the GTO, Firebird, and Grand Prix helped solidify Pontiac as a performance car icon in the 1960’s. But before these legendary nameplates were produced, Pontiac was considered to be a somewhat bland automaker. That all changed once Bunkie Knudsen, and later John DeLorean, took control and transformed Pontiac into a performance powerhouse. In fact, Motor Trend awarded the Tempest its coveted Car of the Year award in 1961. Also, Pontiac’s lineup was so great that Motor Trend awarded the whole brand, not just one car, the Car of the Year Award in 1965. Not even the malaise era of the 1970’s could keep Pontiac from producing some exciting cars. Examples include the 1973 SD-455 Firebird and the 1979 10th Anniversary Trans Am. Not all Pontiacs are as highly regarded as the 1964 GTO and 1969 Firebird. Though not as grand, these cars are still sought after by collectors and aficionados of the brand. The following is a list of a few often overlooked Pontiacs. The poor man’s GTO. Pontiac’s tagline for the GT-37 was “There’s a little GTO in every GT-37. And you don’t have to be over 30 to afford it”. For less coin, almost every GTO option including dual exhaust, floor mounted Hurst shifter, Muncie 3-speed transmission, special Rally II wheels, hold down hood pins, and vinyl body stripes could be included in the package. Power ranged from a spartan 350 cubic inch with 2 barrel carb to the behemoth 455 H.O. with 4 barrel carb. This model is considered by most purists to be the beginning of the end for the legendary nameplate. Styling was mediocre at best compared to the new Grand Am. This was the first and only year the car was based on the new Colonnade body styling that debuted for the 1973 model year. Power was supplied by either a V8 400 with 230 horsepower or a 455 V8 with 250 horsepower. 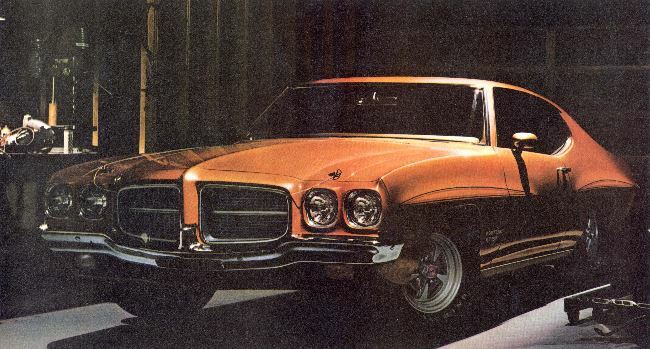 Pontiac originally planned to offer an optional Super Duty 455 in the GTO but pulled the option at the last moment. At least one test car was created with the Super Duty engine. Hi-Performance Cars magazine tested this 455 Super Duty equipped GTO and named it their Car of the Year. They did not realize until it was too late that the Super Duty engine would not be made available. The design for the Grand Am was originally going to be used for the GTO but Pontiac had other ideas. It decided to make the Grand Am a separate model and relegated the GTO as an option package for the Lemans (just as it did for 1972). Styling for the Grand Am was somewhat radical. Its most notable feature was its Enduro nose and grille consisting of two sets of triple angled openings. In 1974, Pontiac created a Grand Am show car called the All American. The car was painted white and featured red and blue striping along the hood and lower body. Even the interior was covered in white with red and blue accent striping on the seats. In its final year of production, the GTO was now an option package for the Ventura. The GTO package included items such as a three speed manual transmission, functional shaker hood scoop, and dual exhaust with splitter extensions. The only available engine was a 350 cubic inch with 4 barrel carburetor. Performance was commendable with a 0-60 time at 7.7 seconds and the quarter mile was reached in 15.72 seconds at 88 MPH. Even with a sales increase over the 1973 model year, Pontiac decided that 7,058 GTO’s produced for the 1974 model year were not enough to justify production and shelved it that year. The Can Am was the brainchild of former Pontiac marketing guru Jim Wangers. 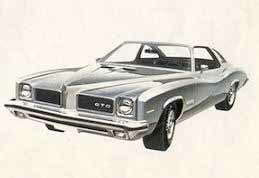 When the car was originally pitched to Pontiac, it was called the Judge (after the legendary GTO moniker). Standard features included cameo white paint with tri-color striping, duck tail spoiler, and body-colored wheels. Wangers’ company, Motortown Corporation, created the coupe by using interior components from the Grand Prix and W-72 powerplant from the Firebird Trans Am. Orders poured in by the thousands but production was stopped at 1,377 cars. A mold used to produce the rear spoiler broke and halted further production. Pontiac management stepped in at this point and decided to cease production. 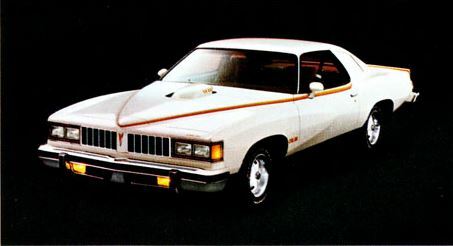 Wangers believes Pontiac really scrapped the project since the Grand Prix was such a hot seller in 1977. The Can Am used the Grand Prix’s dashboard and console, and in doing so, took sales away from the Grand Prix. Due to low production, the Can Am has become quite collectible and can fetch prices in excess of $20.000. 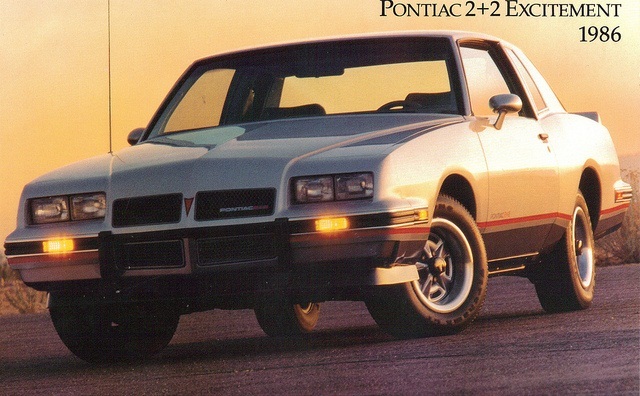 Pontiac created the first production turbocharged gasoline V8 of the 1980’s. The 301 cubic inch engine created 210 horsepower and could run 0-60 in about 8 seconds. Not bad for the times. This engine was certainly more potent than the 301 cubic inch engine with 140 horsepower that came standard in the Trans Am. The Trans Am Turbo used a distinctive hood decal that where the flame from the bird’s mouth extended across the hood’s turbo bulge. Notable examples of the turbo model include the 1980 Indianapolis 500 Pace Car and 1981 Firebird Formula. A limited edition model built to satisfy NASCAR requirements for racing. The name 2+2 came from the legendary Pontiac that was launched in the 60’s. The idea for this sleek aerodynamic coupe was initially proposed by NASCAR legend Richard Petty. Styling cues that set it apart from the regular Grand Prix were rounded front fascia and flat rear glass that extended across to the trunk. Sole power was the 165 horsepower 305 with a 4-speed automatic transmission. Pontiac unleashed a limited number of turbo coupes for the 1989 and 1990 model year. These featured 3.1L V6 engines tuned by ASC/McLaren and a Garrett turbocharger putting out 205 horsepower. These coupes started life as SE models and once converted to turbo models, gold alloy wheels, hood louvers, and special front and rear fascia were added. Pontiac’s new HUD (heads up display) was available only as standard equipment for the Turbo Grand Prix. For 1988, Pontiac decided to inject some extra excitement into the Fiero. It introduced the Formula package for the SE trim. Standard features included free flow exhaust, blackout wheels, 5 speed manual transmission, and rear decklid spoiler. Formula decals also adorned the lower doors. Power was supplied by a 135 horsepower V6 attached to a 5-speed manual transmission. 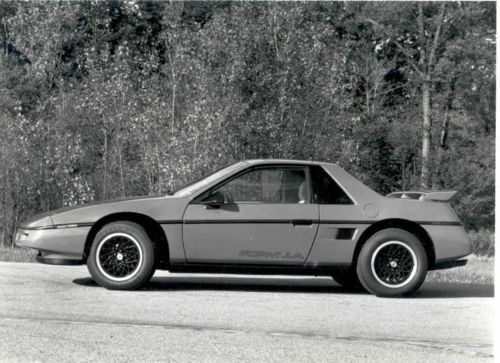 Oddly enough, about the time Pontiac started to get the Fiero right, the car was laid to rest. Just because these Pontiacs are overlooked doesn’t mean they’re not special. Many of these have their own car clubs and, due to their limited numbers, attract quite a lot of attention at car shows. Who knows, maybe you’ll see one of these rare Ponchos at your next car show.